Tuesday services, rockers for pews, a Mason jar chalice and mountain music -- Wild Goose Christian Community is an alternative faith community that celebrates local Appalachian culture. The drive to Indian Valley in rural Floyd County, Virginia, a beautiful mountainous region off the Blue Ridge Parkway, is a time of preparation for some travelers making the trip on a recent late Tuesday afternoon. In mid-April, the rolling hills are bright green. Miles of split-rail fences pass in a whoosh. Grazing cows dot the hillsides. Blooming dogwoods and flame azaleas streak the roadways. 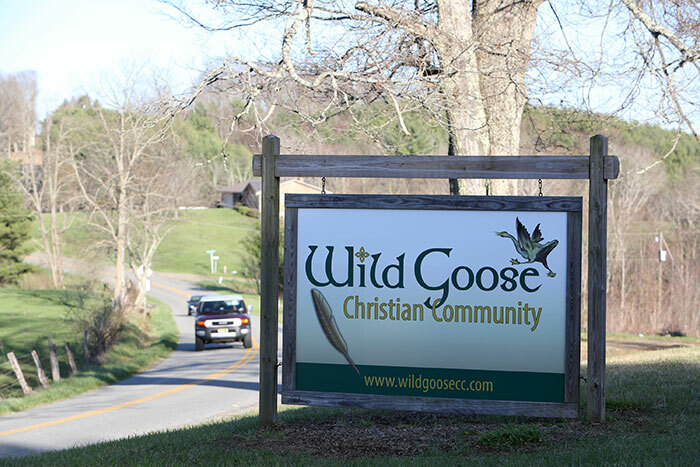 At the top of Macks Mountain Road, a large sign appears: Wild Goose Christian Community. A brick church painted white rises in the distance. At the top of the front stairs, two white rockers sit on either side of a plain colonial-style door. Peggy Slate arrives for the Tuesday night service at Wild Goose Christian Community, former home of Indian River Valley Presbyterian Church. 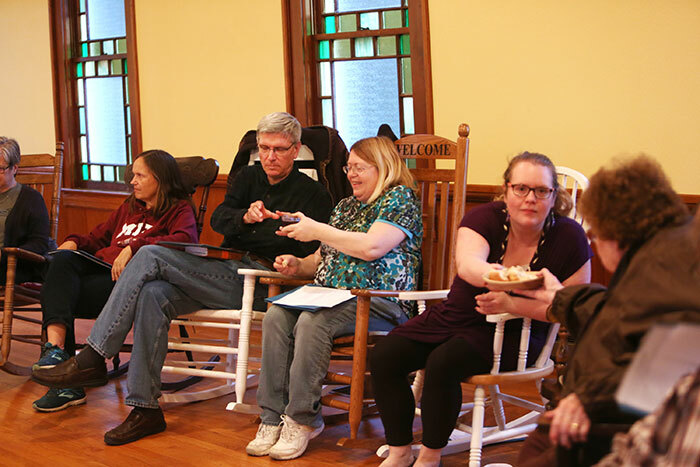 Here, a group of mostly middle-aged people -- 16 this week -- gather on Tuesday evenings for a potluck followed by a conversation about the Christian faith, conducted in the round on mismatched rocking chairs. When does church start for you? When does it end? That Wild Goose mindset is welcoming, open and supportive of mountain culture. It’s especially appealing to Wolford, a 53-year-old computer professional who was born in the mountains but quit church more than 30 years ago. What is your church’s mindset? Like some others, Wolford first heard about Wild Goose from a story broadcast on a local public radio station, and he quickly became a die-hard fan. Since it opened five years ago, the congregation (which has no formal membership) has emerged as an example of an alternative faith community focused on drawing people who don’t find traditional churches -- whether old-style liturgical or big-box megachurch -- appealing. Worship begins with communion, as Wild Goose participants pass bread and wine around the circle. Wild Goose is part of the Protestant mainline -- Presbyterian Church (U.S.A.) -- but it doesn’t act like it. Here the service begins with communion from a Mason jar followed by Appalachian singing led by two musicians on banjo and guitar. There are no pews in this church. Right now, there’s no pastor, either. The founding pastor moved to Baltimore last fall to be closer to family, but the congregation is hoping to find a new one to fill the vacancy. At a time when many churches are closing and dying, Wild Goose has drawn attention far beyond the Appalachian Mountains for its inspired approach to ministry. 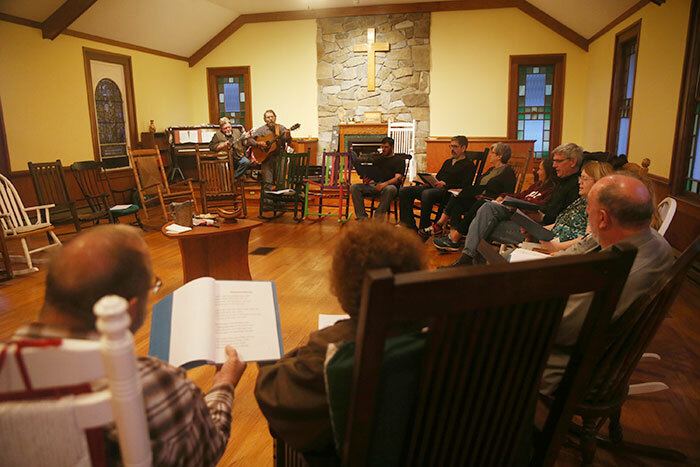 It is one of a dozen congregations profiled in “Divergent Church: The Bright Promise of Alternative Faith Communities,” by Tim Shapiro and Kara Faris of the Center for Congregations in Indianapolis. “We were looking to find congregations that were innovative or creative or might be attractive to people who would otherwise not want to go to a traditional church or a contemporary church,” said Faris, the center’s resource grants director. For Wolford, the congregation is a perfect fit: “There were a lot of elements to traditional church that really turned me off,” he said. At Wild Goose, he’s been able to nurture his spiritual yearnings and remain true to who he is. He’s on a spiritual journey, and he looks to this fellowship of mountain people to guide him through. The Wild Goose community sings a hymn, accompanied by Malcolm Smith on banjo and Mac Traynham on guitar. It began with Appalachian music. The Rev. Edwin Lacy grew up in the Appalachian Mountains hearing his father, a banjo player, make old-time mountain and bluegrass music. After graduating from college, he too took up the banjo and played professionally for about 15 years before going to seminary and becoming an ordained minister in the Presbyterian Church (U.S.A.). In 2012, Lacy was leading a PCUSA church in Bristol, Virginia, about a two-hour drive to the west, when he heard that the Indian Valley Presbyterian Church in Floyd County had closed. 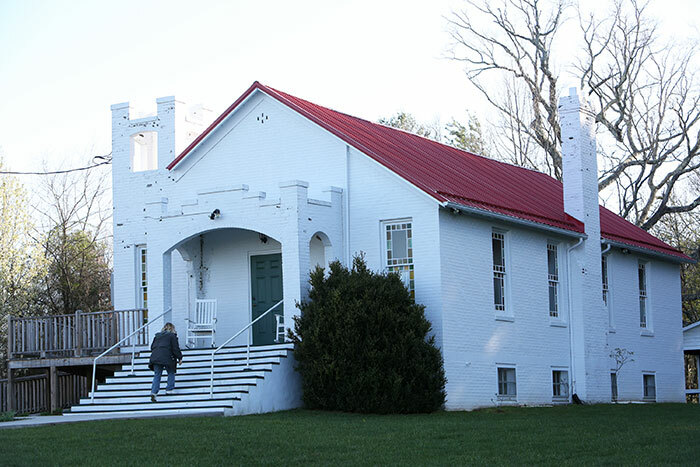 Like many congregations in the Abingdon Presbytery, which stretches across 13 counties in southwestern Virginia, Indian Valley Presbyterian had dwindled in size over the years. And Lacy had an idea. Instead of closing the church and selling the building, how about trying something different in that remote mountain spot? Lacy wanted to take advantage of the area’s musical heritage to draw in a newer generation of mountain people: artisans, crafters, musicians and Florida snowbirds who had been buying up homes in the region. Soon, he approached the presbytery with a plan to form an alternative congregation. It happened to coincide with a denominational initiative called “1001 New Worshiping Communities,” a PCUSA project to start as many congregations in 10 years to meet the needs of a changing culture. The presbytery agreed, and by 2013, Lacy and a retired contractor began ripping out the carpet and the pews in the old Indian Valley church and installing decorative wooden beams on the ceiling and a gas fireplace. Lacy didn’t want to hold services on Sunday mornings or Wednesday evenings, so as not to compete with other churches. He also wanted to avoid Friday evenings, when people might be heading out of town. That left Mondays, Tuesdays and Thursdays. He chose Tuesdays. Music would be central to this alternative community. So he reached out to Mac Traynham, one of the best Appalachian musicians in the area and a master builder of old-time banjos. Traynham, it turned out, used to attend Indian Valley Presbyterian years ago when his children were young. Lacy also came up with a novel name for the community: Wild Goose. He figured since the majority of people who settled Southern Appalachia were Scots-Irish, they might appreciate the Celtic symbol for the Holy Spirit. And there was another reason the name worked: creating such a community can seem, at times, like a proverbial wild goose chase. At the top of Macks Mountain Road, the Wild Goose Christian Community sign is a welcome sight for those journeying to the Tuesday night service. Whatever its official status, Wild Goose Christian Community has been exciting to watch, said the Rev. Tony Palubicki, the pastor of Big Stone Gap Presbyterian Church in Big Stone Gap, Virginia. 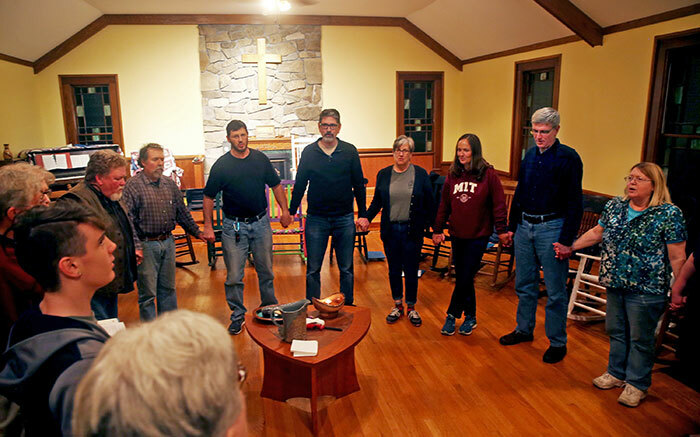 “In an area where things can get pretty static, it’s interesting to see the Holy Spirit working in new, wonderful ways,” said Palubicki, who serves on the Abingdon Presbytery’s church development committee. Renewing Christian community in rural Appalachia has a long history. Back in the 1930s and ’40s, Floyd County and the surrounding region, like much of Southern Appalachia, was isolated and poor, with high rates of alcoholism and violence. The Rev. Bob Childress, a Presbyterian minister who grew up in the county’s Buffalo Mountain community, took it upon himself to reform the region’s culture and educate its young. Traveling tens of thousands of miles a year as a circuit preacher, ministering to families and leading as many as 14 services a week, he helped establish a dozen schools and churches, including the Indian Valley church. Today, many of those same churches are facing different headwinds: a nationwide decline in church attendance and the flight of many residents to more urban areas with better jobs and greater opportunities. Does your church talk "with" or "to"? How does that shape worship? Today, only half the churches in the Abingdon Presbytery are served full time by ordained ministers. In some cases, one minister will serve several churches. In others, a lay pastor will be appointed to direct the local congregation. Under Lacy’s leadership, Wild Goose grew to a healthy size, especially in the summer months, when it would draw up to 50 people. Last fall, though, Lacy moved to Baltimore to be closer to his children and grandchildren. Tuesday evenings now draw around 15 to 20 people in the winter months, 30 to 40 in the summer. Most if not all of the regulars drive an average of 30 minutes to attend. Worshippers gather in a circle, hold hands and pray as the service comes to a close. But Wild Goose has a dedicated following. And those people are not about to give up. What is the appeal of Wild Goose Christian Community? What does it provide that your church doesn’t? The community is now looking for a new leader and is working with the presbytery to find a pastor who could serve Wild Goose and two other, more traditional PCUSA churches in the area. That leader will have to have an appreciation for Appalachian music. The community has monthly concerts and square dances in the church and would like to see those continue. Though some participants attend other churches on Sundays, others consider Wild Goose their one and only church. The emphasis on local culture is especially appealing to many of those who don’t attend church anywhere else. Appalachia has a distinct local culture. How well does your church reflect its cultural context? 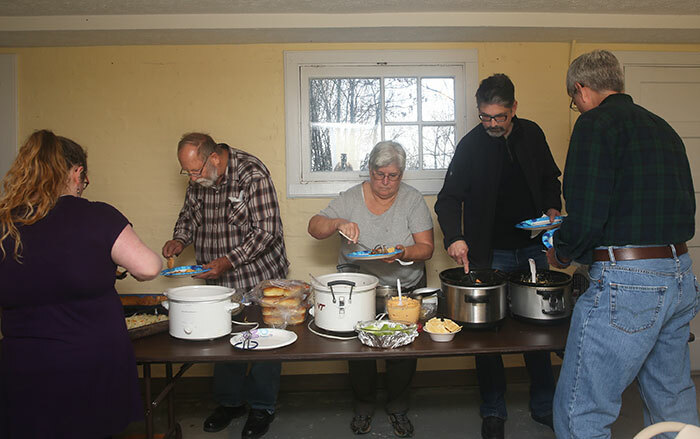 On a recent Tuesday night, folks began streaming into the church basement after 6 p.m., bearing Crock-Pots and covered dishes: mac and cheese, pulled pork, mushroom lasagna, potato soup. Before the Tuesday service, Wild Goose participants make their way through a potluck of comfort food. One person volunteered a short blessing and then lines formed around a long table. After heaping comfort food onto paper plates, participants sat down at round tables to eat and talk. One woman relayed stories about her recent bicycle trip to Vietnam, Cambodia and Thailand. Another talked about a new church with the name Wild Goose that had just formed in Bonsack, a town north of Roanoke. The Indian Valley area is so isolated that cellphone signals are especially weak, and at the Tuesday gatherings, nobody pulls out a phone. For Slate, who drives an hour from Blacksburg where she works as a residency coordinator at a hospital, that’s a relief. “It’s nice to unplug and not get texts or phone calls or anything,” she said. By 7:45, participants headed upstairs to take their seats in rocking chairs. Guydell Slate, Susan’s father, an elder in the Presbyterian Church, served communion, pouring wine into a Mason jar and passing around a long Italian roll for people to break off pieces and dip into the wine, while Traynham played a solo on the fiddle. After singing “Keep on the Sunny Side” and “A Beautiful Life,” the group, led by Charlie Martin, discussed four verses from Luke 9 in which Jesus sends out his disciples to proclaim his message: “He told them: ‘Take nothing for the journey -- no staff, no bag, no bread, no money, no extra shirt. Whatever house you enter, stay there until you leave that town’” (Luke 9:3-4 NIV). The discussion touched on changing expectations of hospitality, attitudes toward missionaries who knock on people’s doors and learning to accept rejection. After 30 minutes, the discussion wound down and the banjo and guitar players picked up their instruments for another round of songs. Finally, people stood up, held hands in a circle and bid each other peace and goodbye. Outside, the sun had long ago set. As engines revved and tires crunched across the gravel drive, the worshippers began their descent down the mountain with the stars to guide them home. What does it mean to be talked with rather than to? How does that shape worship at your church? Appalachia is an area that still has a distinct local culture. What is the cultural context for your church? How does that shape its ministry?